Home › Digital Post › Absolutely awesome! This month, Baxter Travel Media launches its fourth season of the successful Baxter Student Ambassador Program. It’s the only travel and tourism student mentoring program of its kind in Canada, offering learning and networking opportunities for aspiring travel industry professionals. 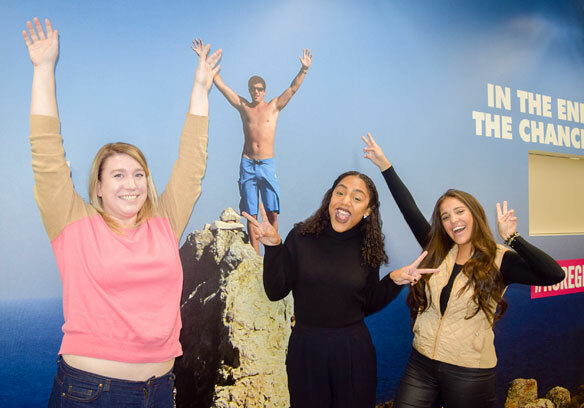 All three women are finding professional success as part of The Travel Corporation’s Contiki and Trafalgar brands. Both Hausermann, who graduated from Ryerson University’s Hospitality & Tourism Management program in 2016, and Teran, who graduated from Sheridan College’s Tourism & Travel program also in 2016, work together as Contact Sales Consultants on the Contiki reservations team. It’s clear these two are close colleagues and friends, a connection, no doubt, ignited by their shared BSAP experience. As members of the reservations team, they focus on helping other millennials find their perfect vacation. Teran loves sharing her passion for travel, her company, and the industry. She takes equal parts pleasure and pride in her role talking directly to travel agents and potential travellers, “I might be in sales, but I’m selling experiences of a lifetime. How amazing.” The twosome also act as brand ambassadors, participating in marketing efforts like trade events and campus invasions. Cain’s journey to Trafalgar began just over a year ago when she entered Fleming College’s Travel – Global Tourism program, and dreamed of one day working at Contiki. Little did she know that one day was just around the corner. In May, she was awarded BSAP’s coveted Contiki internship, and ultimately landed a permanent position at sister brand Trafalgar. As a Reservations Agent with Trafalgar USA, Cain helps make dreams come true. Clearly passionate, determined, and a hard worker, Cain is quickly accelerating in her career. “She’s only been here a few months, and she’s already training someone else and got a spot on a FAM. It’s pretty clear she’s doing a great job and that is recognized by her manager,” noted Jenni Berg, National Business Development Executive, Contiki Holidays and BSAP champion. This year marks Contiki’s second as a BSAP sponsor. The partnership was a natural fit for both organizations that are equally committed to supporting the next generation of travel. For Contiki, participating in BSAP is important because it means a new way to connect with their 18-35 target market, as well as a way to support new talent in the industry. But most of all, it’s a huge win for the students. Asked what the most valuable takeaway from their BSAP experience was, Hausermann, Teran and Cain confer before agreeing that it was definitely networking: meeting fellow students, sponsors, and industry leaders was helpful and inspiring. Plus, dropping the Baxter name beyond the BSAP bubble is an effective opener in any professional situation. Nodding in agreement, Hausermann confirms, “BSAP is like a passport to being legitimate in the industry.” There’s still time to get involved in this year’s Baxter Student Ambassador Program. For information on becoming a program sponsor, participating school, or to find out more about how you can get involved, get in touch with the BSAP team today at info@baxter.net .